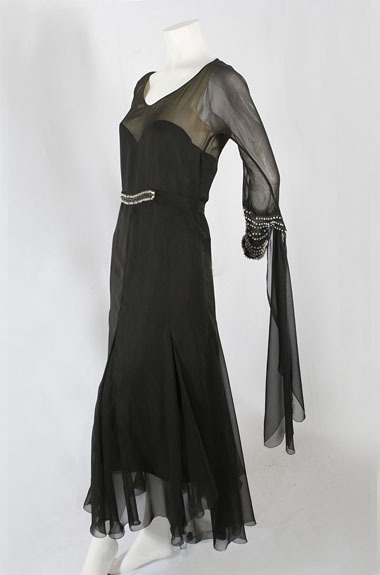 This is a Ginger Rogers dress! 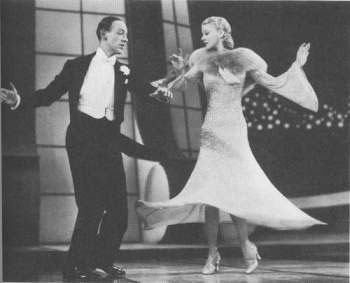 Ginger and Fred Astaire danced their way to stardom in nine movie hits of the 1930s. With swirling skirt and sleeves, a dazzling dance dress shaped for movement makes a great dance even more spectacular. Made with an outer layer of black silk chiffon over a black silk crepe slip, the stylish dress is ingeniously constructed: the beige chiffon top of the slip is attached to the dress at the neckline. The sleeves and belt front are embellished with large opaque white beads and clear crystal seed beads. The dress and slip close separately on the side with snaps. 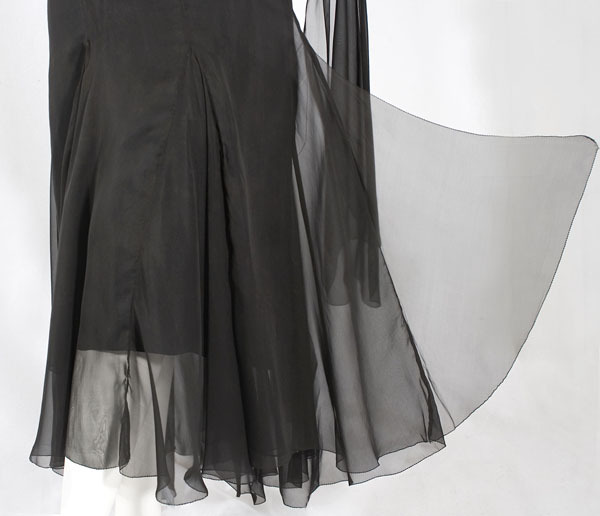 The ankle-length gored skirt flares above the knee with inserted bias-cut panels and flounces. Thesculptured shape of the sleeves is accented with beading and attached scarves. 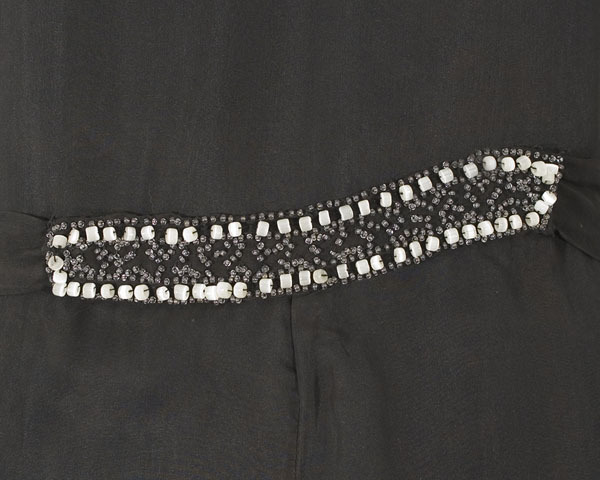 The beaded front of the belt is attached to the dress; in back are sash ties. 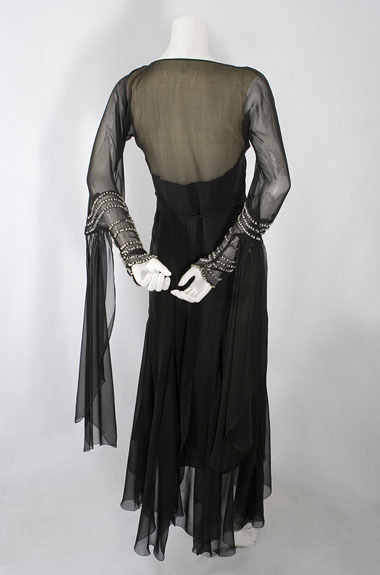 The 1930s dance dress was the favorite child of late 1920s streamlined Deco. This hypermodern look appeared in fashion, architecture, and movie set design. In Rogers' and Astaire's first film, Flying Down to Rio (1933), the duo were always backed up and shown off by gleaming, streamlined, modern movie sets. The Carioca dance number was done in an outdoor casino filled with sunshine, light, and space. Twin curving stairs, 7 white pianos in the middle, high concave walls, giant butterflies on the parapets—all convey a sense of delight in freedom. It took the Depression audience's mind off its troubles. Ginger Rogers won a Charleston contest at age 14. If you have never won a dance contest, take heart because neither did Fred Astaire. (He never entered one but started dancing professionally at age 8.) 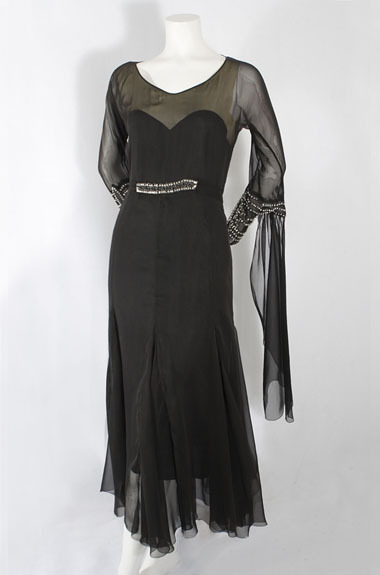 This is the dress to wear when you have found your Fred Astaire and are ready to dance The Piccolino (Top Hat, 1935). It measures: 36" bust, 32" waist, 38" hip, 16" from shoulder to waist, and 54" from shoulder to hem.